There likely won’t be a more wild trade before the deadline than the one that took the better part of Friday to finally be completed. The Pittsburgh Penguins had Ottawa Senators forward Derick Brassard in their grasp, then lost him, and then snatched him up again. Penguins defenseman Ian Cole was headed to a bad team, then he wasn’t, and then he was again. And somehow Ryan Reaves is now with the Vegas Golden Knights and the NHL’s newest team is retaining a bunch of salary. The first trade: Penguins receive Derick Brassard; Senators get a first-round pick, Ian Coleand intriguing goalie prospect Filip Gustavsson. This deal was rejected by the NHL for “improper use of salary retention,” so it was back to the drawing board for all involved. The second (and actual) trade: Penguins receive Derick Brassard; Senators get a first-round pick, Ian Cole and intriguing goalie prospect Filip Gustavsson. This didn’t change. Penguins also acquire a 2018 third round draft pick and prospect forward Vincent Dunn from the Senators; and they also get prospect forward Tobias Lindberg from the Golden Knights. Vegas receives Ryan Reaves and a 2018 fourth-rounder (Vancouver’s) from the Penguins and also retains 40 percent of Brassard’s salary. The #Pens have acquired forward Derick Brassard in a three-team trade with Ottawa & Vegas. PIT also received a 2018 3rd-round draft pick and prospect forward Vincent Dunn from the Sens and prospect forward Tobias Lindberg from the Golden Knights. Oh, texting Dom, your so jovial with your "Haha's". Let me just say, this is some fine moving and shaking by Pittsburgh's beloved GM or should I say "Slippin' Jimmy" Rutherford aka: NHL's Saul Goodman? Losing Cole stinks, but just seeing what we get in return, plus the fact that Vegas eats 40% of Brassard's salary for the Pens, that's pretty akin to getting a wadful of green in exchange for some knock-off Rolexes. Hell, I bet he wrote out that second deal in like five minutes on toilet paper. ...when he swindled nice old lady Irene to sign some of her cash over at the end of season three. "Yes, Vegas. This shoe looks just exquisite." You just know JR dotted them "i''s and crossed them "t"'s. Wow, just can't help be astounded by this deal. Brassard's playoff stats are just bonkers too. 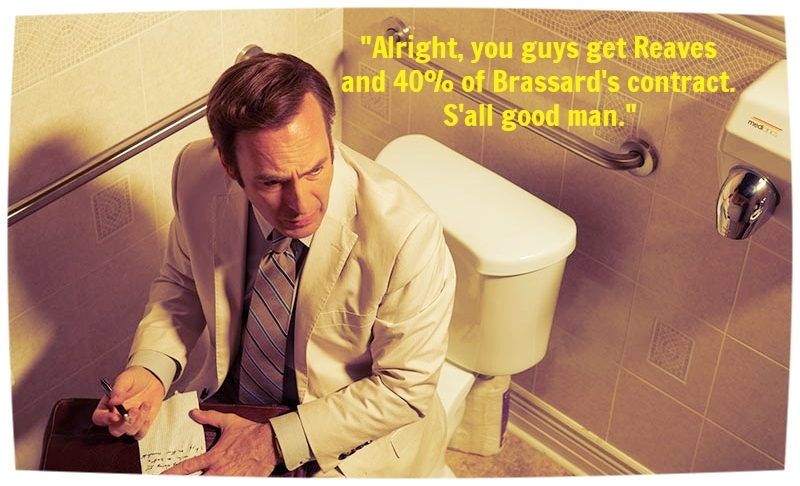 Media: "Why did you want Brassard?" Rutherford: "Why not? [Smiles] Have you seen him play? He's got 18 goals, 38 points. He plays center. We've tried to get more depth at center and more insurance there... What we're trying to do now is win."